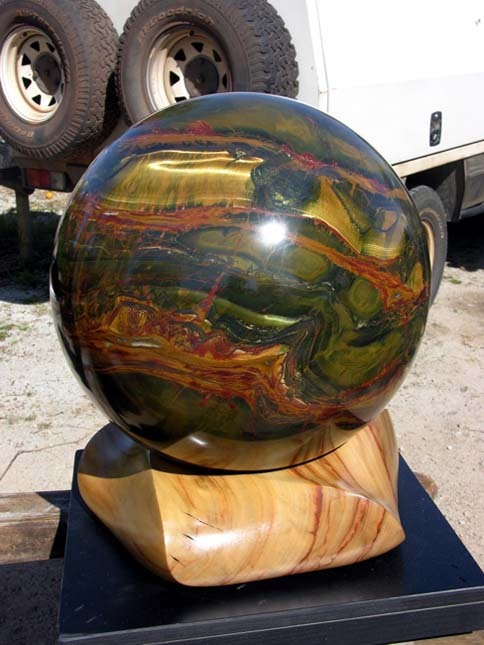 This amazing stone of natural art was found on Mt. Brockman Station about 100 kms N.W. of Tom Price. 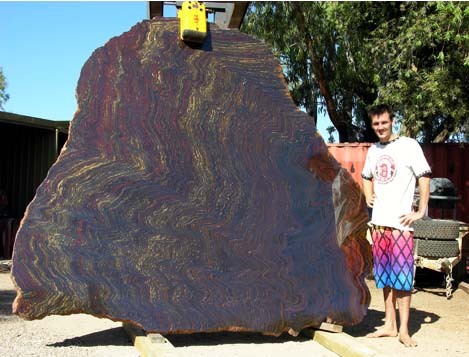 It is found only in Western Australia and is sought after by collectors because of its rarity and value. It is extremely old forming when the earth was a barren globe and life not due to start for another 2000 million years. Below is a condensed report by Mrs Jenny Bevan, lecturer in geology at the University of Western Australia. This report and description applies equally to Tiger Iron which is found in a more Northerly location. 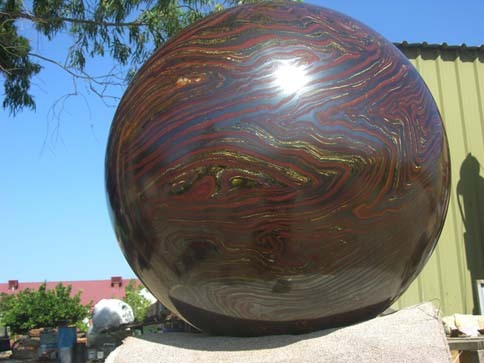 The difference is that it has been much more distorted by pressure giving some pieces spectacular folding and banding. These sediments were laid down at the bottom of a shallow sea over two and a half billion years ago. The early earth's atmosphere had little or no oxygen. When oxygen producing photosynthetic bacteria first evolved more than 2700 million years ago they gave off oxygen as a waste product which built up in the atmosphere and dissolved in sea water. 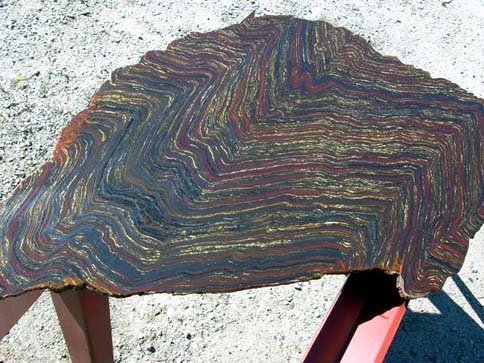 When iron, produced mainly from huge submarine volcanoes came in contact with this oxygen, it precipitated as iron oxide in the sea floor mud and resulted in iron rich bands and silica rich bands now classified as a banded iron formation ("BIF"). Other minerals were also present and heating and burial bought about crystallization of layers and, most likely, solutions carrying sodium penetrated along some layers rather than others, this is where "Riebeckite" was formed. Earth movements throughout the millions of years caused crumbling, folding and distortion to the layers of sediments. Also heated watery fluids passing through the rock can dissolve material and redeposit it elsewhere. 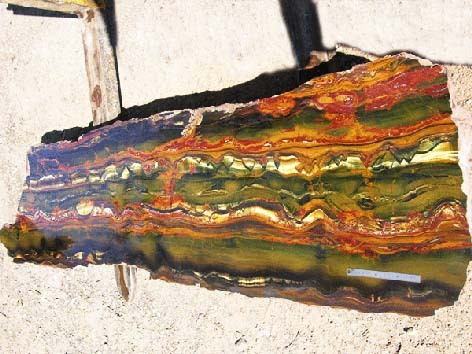 The fibrous layers of Riebeckite crystals have in this case been replaced by silica with fine dust of yellow Goethite outlining the shape of the original crystals forming Tiger Eye. 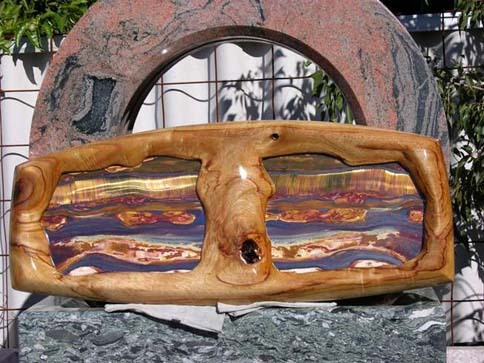 In the same way fossil wood preserves the outline of cells and growth rings. About 2000 million years ago the Pilbara and many of the other very old pieces of the continental crust were joined together in a supercontinent. 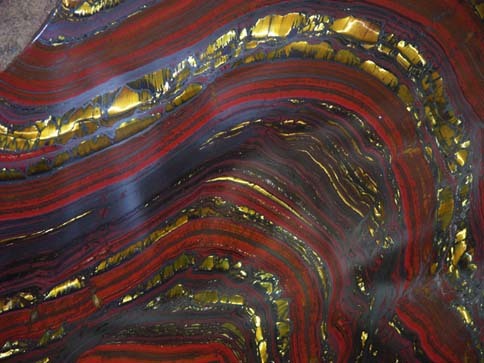 When this supercontinent started to break up, waters heated by volcanic activity dissolved much silica from the banded iron formation, leaving huge iron ore deposits of almost pure hematite (more than 65% iron). Occasionally there is a red hematite crystal outline. In other places, red and yellow iron oxides and/or silica have been deposited as veins or replaced the wall areas of fine cracks in the rock. There have probably been several phases of this mobilization, some quite early on and some much later. So, what minerals make the colours? WHITE - Quartz: SiO2 The pure mineral is colourless or white. 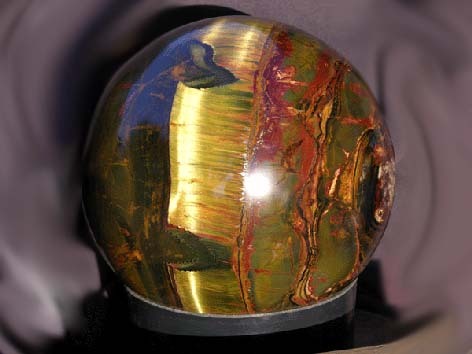 However, if it encloses a microscopic dust of coloured minerals, it will take on that colour, so jasper, for example, is quartz coloured by red hematite (iron oxide). YELLOW - Goethite: FeO(OH) - may also contain other hydrated iron oxides, "limonite". The powdered mineral is yellow. 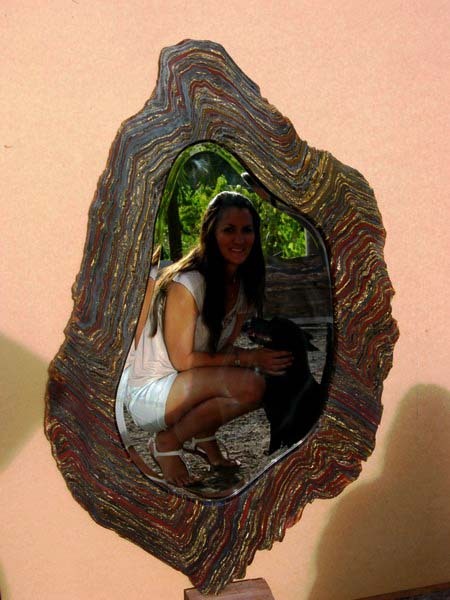 Goethite can also be shades of brown when in larger crystals. RED - Hematite: Fe203 The powdered mineral is blood red. 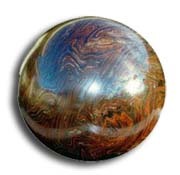 The mineral can also have a dark grey, metallic appearance when in larger crystals. BLUE - Riebeckite Na2Fes[Si80~](OH)~ This is a dark blue fibrous amphibole mineral, sometimes called "crocidolite".